Opening hours: The garden is usually open from the month of April to October from 6:00 to 22:00 o'clock and from the month of November to March from 7:00 to 17:30 o'clock. 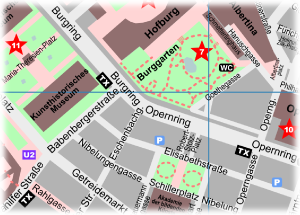 Entrances are available from the Ringstrasse and from the Hanuschgasse at the Albertina. Tip: Enjoy your coffee and other delicacies on the terrace or directly in the palm house in a special atmosphere. The Burggarten Vienna Garden (B1/B2/C2) was laid out in the year 1818 as a private garden of the emperor on an area of approx. 38.000 m². It is located directly at the Ringstrasse beside the Hofburg and the Albertina. Just like the Volksgarten the responsible planners of this park were Ludwig Gabriel von Remy and the court gardener Franz Antoine the older. The specialty about this design was the participation of emperor Franz who was an educated gardener and selected new types of plants from all over the world. Over the years the layout was adapted to the style of an English landscape garden and a pond was added. It took some time until it was opened to the public in the year 1919 together with its monuments (e.g. marble statue from Mozart and bronze statue from emperor Franz Joseph) and the Palmenhaus (palm house). Before that the Viennese citizens had only the possibility to look at this park through a mighty but beautiful styled fence. The fence of the Burggarten and also that one of the Volksgarten were detailed renovated with a similar gold platen and color as used originally in 1863. This monumental appearing iron grate looks very impressive with its generous decorations and the royal look. In the year 1901 they started with the construction of the 2.000 m² sized palm house (Palmenhaus). 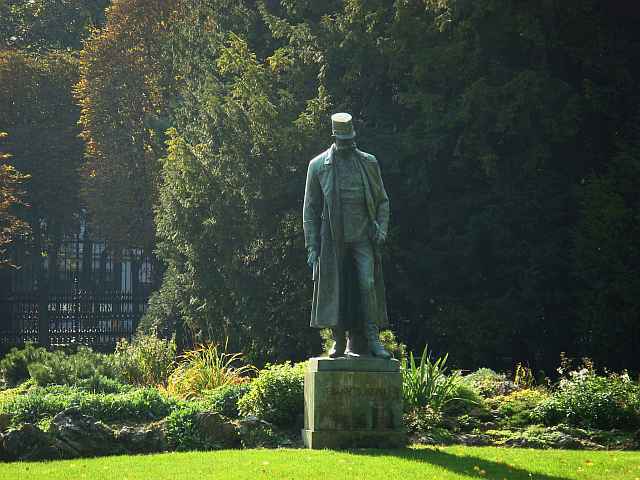 Friedrich Ohman designed this building which consists of glass and steel and supervised also the 5 years lasting building time of the last big orangery of the Habsburger. The emperor used his private green house for relaxing and brought with it the nature into the center of Vienna. In the left part you can find the butterfly house where the visitor can watch exotic, free flying butterflies in a close to tropical nature recreated surrounding. The entrance fee is approximately 7,00 Euro. The Cafe-Restaurant Palmenhaus is located in the middle part which is around 15 m high. Between up to 10 m high palm trees you can have there in a stylish surrounding something to drink or eat and also watch through a glass wall the butterflies in the left part of the building. The terrace of the palm house is also a very nice place to stay. At a (coffee) break you can enjoy the view down to the Burggarten Vienna. The right part of the orangery is used by the federal garden administration as a storage room where also the bouquet making is situated. The preparations for the flower arrangements for some important events like the opera ball and some official receptions are done here.